Our Garden Department is a plant pharmacy, supply section, fertilizer facility, and information station rolled into one. From insect, weed and disease control to lawns, hydroponics supplies and tools, we’re able to supply you with the means to garden successfully. Country Garden is particularly proud that many employees in this department are Massachusetts NOFA certified organic land care professionals. We’re dedicated to the expansion of our organic product lines, the preservation of Cape Cod resources, and the continuing education of our customers regarding least-toxic landscaping. 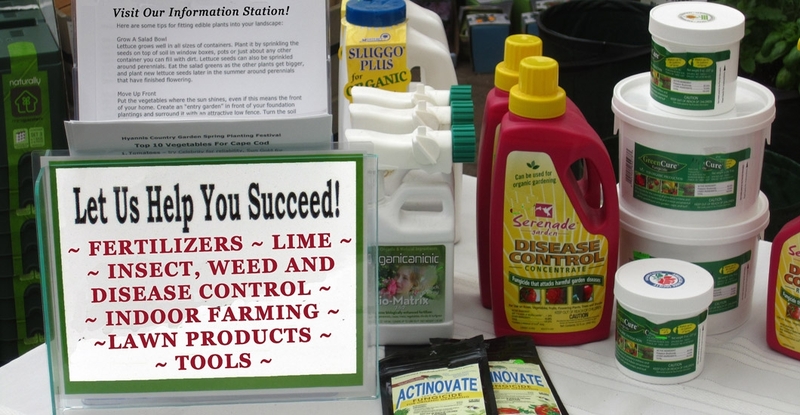 Whether you’re interested in organic responses or conventional solutions to landscape difficulties, we hope you’ll drop by to see Country Garden’s selection of products and problem-solvers. Craig Nelson is the manager of this area of the store.